Breaking news: Rachel Clattenburg smashed through the sub-three hour marathon barrier and ran a personal best of 2:57:58 for the win at today’s 18th Annual New Jersey Marathon. She was more than 12 minutes ahead of the second fastest woman in the field. Report. Results. Article and photo. Rachel is now tied for 16th fastest WRC woman marathoner ever, and will be added to our list of Top Club Marathoners. And on Saturday, Paul Karlsen won the SSC Wounded Warrior Run 10K in Rockville, MD. Results. Photos. Update: Vice President Carla Freyvogel ran the Nike Women’s Half Marathon in Washington, DC, with her daughter, Grace Eginton (of the South Brooklyn Running Club). And Liz Lambert brought her own daughter, Evelyn Hamblet, to her first of many post-SDR meetups! After last year’s return to the scene, the Washington Running Club is back to contending for team titles in all four divisions (Men’s Open, Women’s Open, Men’s Masters, and Women’s Masters) at the 2014 Boston Marathon. We’re liveblogging on race day with news, statistics, and color commentary. In addition to the Mobile and Individual Tracking pages, Team Tracking featuring dynamic standings and team member splits across various checkpoints is also available. There are many options to lengthen or shorten this route. Start and finish at 33rd and M in Georgetown. We may have a reporter joining us. 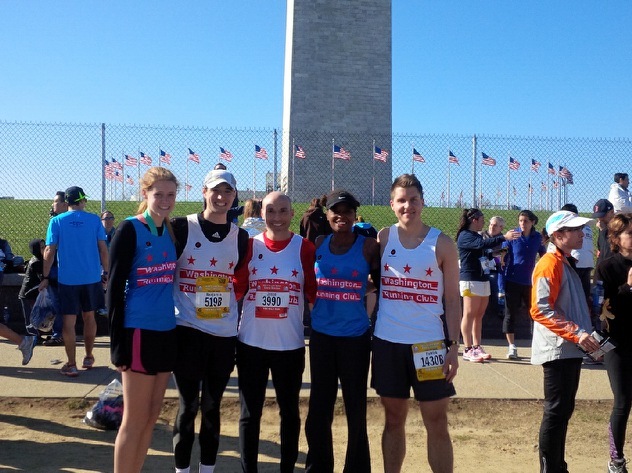 WRC had a great turnout at this past Sunday’s Cherry Blossom 10 Miler – both on and around the course. We had over 20 club members running the race with another dozen or so sprinkled around the course cheering everyone on! The support from fellow club members proved to be extra valuable as many came away with major PR’s. Feeling cheery after the 2014 Cherry Blossom 10 Miler! WRCers L-R: Kendall Tucker, Ben Stutts, Jesse Frantz, Julia Taylor, and Pat O’Keefe. The official results will be made available on the race website.